French entry to Eurovision 2011 is Amaury Vassili with song Sonniu (Dream). On 27 January 2011, it was announced by the French broadcaster France Télévisions that Vassili would be the participant from France at the Eurovision Song Contest Live to be held in Düsseldorf, Germany. The song Sonniu will be performed in Corsican. It marks the second French Eurovision entry to be performed in the language after Patrick Fiori received a fourth-place finish with “Mama Corsica” in 1993. Amaury Vassili is a 21 years old French singer and the youngest professional tenor in the world. His debut album Vincero from 2009 went double platinum in France, and he’s got an international success with releases in Canada, South Africa, and South Korea. The song has been composed by Daniel Moyne and Quentin Bachelet (son of French singer Pierre Bachelet), who has been working with Vassili since the beginning of his career. The lyrics of Sonniu have been written by Jean-Pierre Marcellesi. 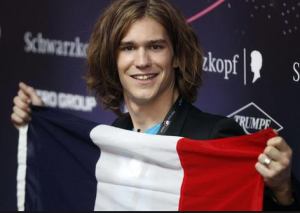 France goal at Eurovision Song Contest 2011 is clear – French participant Amaury Vassili needs to win in Düsseldorf. He’s got strong vocals, great looks and he is ready to compete at Eurovision 2011 in Düsseldorf already in Final, so we can only wait and hope to see him!